The year, in our accounting, was around 740BC. The Kingdom of Israel had divided into two separate nations some two hundred years before, on the death of Solomon, and there had little peace or prosperity ever since. But the time of King Uzziah had been somewhat stable; he reigned for over fifty years, and thanks (at least in part) to his development of military technology, the Southern Kingdom, Judah, had known a time of relative peace. But the last few years of his life foreshadowed the chaos that was to come; confined to his home for the last ten years of his life with a skin disease, he reigned in name, while his son Jotham ruled in practice. Still, the respect in which Uzziah was held by the people kept the peace as long as he lived. But this was the year that he died. Jotham would reign for another four years, but they would be years of struggle and conflict, years in which the worship of God would be forgotten, the sanctity of the Temple defiled. The Northern Kingdom had fallen to the invading Assyrian army, and there were those within Judah who would welcome the embrace of the might of the Assyrians; happy to trade their freedom for the security of a powerful force that promised to keep them safe, give them security in an uncertain world. And the pro-Assyrian movement within Judah finally overthrew Jotham, installing his son, Ahaz, as their puppet ruler. It was a time of upheaval, a time of change, a time of uncertainty, of nations divided, of fear. That was the year that Isaiah saw the Lord. The message that Isaiah was given by God to deliver to the people was depressingly familiar. The second half of Isaiah chapter six describes a people floundering and thrashing about but never finding the answer. they would turn and be healed. It’s a pretty sad but terribly realistic description of humankind, really, isn’t it. The people would refuse to see what was right before their eyes; refuse to take notice of the evidence of their ears; refuse to think about what they were doing and where their decisions might lead them. In fear, or uncertainty, or perhaps out of resentment towards a ruling elite who had forgotten them, they would choose to hand power to a despot, despite what they had seen and heard of his past actions. History repeats itself. Has to. No-one listens. But here’s the interesting thing about the early chapters of Isaiah, addressed to the people of God who had turned their backs on the worship of Yahweh to follow the Gods of other nations: you do not find in the words of the prophet any sense of condemnation for those who had been so led astray. For their leaders, for those who manipulate them to secure their own privilege, wealth and power, yes. But for the nation, for the people, the words of God spoken through the prophet are words of judgement, yes, and foretellings of tragedy (tragedy that they will bring upon themselves by the disastrous choices they are making), but tinged throughout with sadness, not with anger. 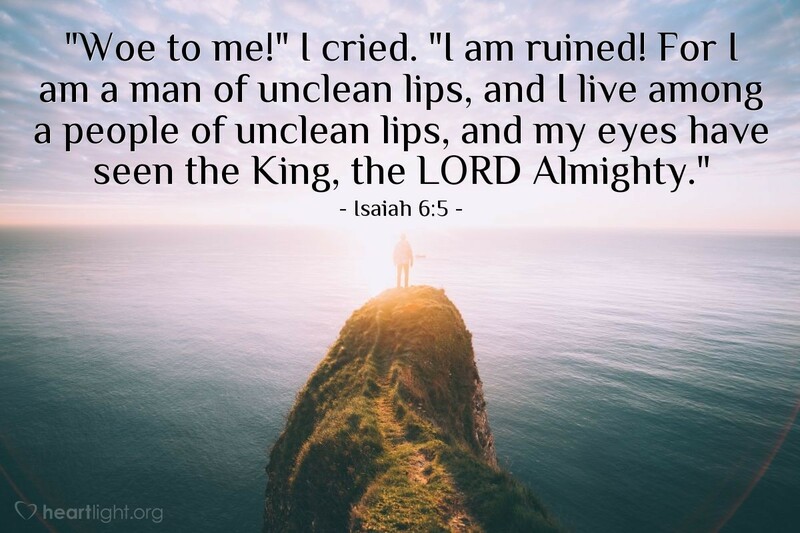 No, Isaiah’s first reaction was this: “I am a man of unclean lips,” – identifying himself with the sinfulness of the people; and only then “and I live amongst a people of unclean lips.”. Isaiah recognises the failings of the nation; but he does not claim himself to be any better. Instead, his first reaction when he has a vision of God is to know his own shortcomings. In our gospel reading, hundreds of years later, Simon has been listening to Jesus preach, providing him with a boat as his platform, when, in the miracle of the fish he realised who Jesus was. And Simon’s first response is precisely the same as Isaiah’s: “Go from me, Lord, for I am a sinful man”. It almost seems to be a prerequisite for those who God will choose to call; that they start off by being first and foremost aware of their own shortcomings, not confident in their own power and righteousness. They start by identifying themselves with the imperfections of the world; they begin in a recognition that they are part of the problem; that they, like everyone around them, had not lived according to the way of God; had not loved, listened, worshipped, given, forgiven, loved again. That they are people like everyone else. Simon and Isaiah each knew that they were not worthy to be the instruments of God’s mission in the world. Isaiah feared that he would die in the face of God, so strongly was he aware of his complicity in the sin of the nation; Simon felt instinctively that he was not good enough even to be found in the same boat as Jesus. These were the people that God called to be God’s instruments. For God is not ashamed to be associated with us, even if we feel unworthy to be associated with God. On the contrary; those who considered themselves superior, wiser, more important, more godly – the leaders of Isaiah’s day, the Pharisees and Priests of Jesus’ day (or rather – some of the Pharisees and some of the Priests; for amongst both groups were found many who heard Jesus’ words with humility of spirit and desire to learn and grow) – those who thought they belonged in the places of the things of God, the ones who thought that they were better than their community, better than those others – those were the ones God seems most distant from. But for those who knew themselves to be in need of God; for Isaiah, for Simon, and perhaps, for us, there is instead a pattern. Their sense of their own shortcomings is met by God with forgiveness, with love, with grace; and then they, assured by God of their value, their worth, their importance, not because of anything they have done but simply because God loves them; then, inspired with this confidence, they go. They go into the world not as people who think themselves superior, but as people who have encountered the life-changing love of God that accepted them as exactly the people they were, and know that that same offer love is held out to all. and Sent in the name and service of that love.